I love the holidays! Is there anything better than getting to spend time with your family and friends? Especially since this is the time of year of great eating with those friends and family. We don't live by our family so our holidays look a little different than others. We have close friends over or it's just the five of us. This year for Thanksgiving it was just the five of us and as it turned out it was the perfect year to not have any friends or family over. It might have been a party of 5, but I didn't skimp on the dinner. Thanksgiving 2015 was the year my twins were sick and Mark came down with pneumonia. It's a good things that we kept those germs to ourselves. With a low key Thanksgiving it's nice that we have December to spend time with our family. My in-laws came in town before Christmas. We did tons of Christmas activities from the Christmas parade to sledding in 60 degree weather. You just have to love living in NC! I still can't believe we ate outside in December in short sleeves. I don't know about you but company coming to town means cooking great meals and eating out. I love trying new recipes on my in-laws since they pretty much like everything that I cook. They're pretty awesome that way. On this trip I tried out a new chicken in wine dish where you cook the chicken in a bottle of wine and then add cream at the end of the cooking time. It didn't, the meal was delicious and decadent. But unfortunately it was also heartburn inducing. Pretty sure every gingerbread house needs a candy moat. Their visit was tens days of eating good food, cookies, all that candy from the gingerbread house, and lots of wine. Which means that it was ten days of putting our stomachs to the test. I knew going in that my heartburn wasn't going to hold up to all that decadent eating and drinking. Knowing I needed a solution to my heartburn problem, I agreed to blog about Nexium 24HR as a member of the Smiley360. All opinions are mine. Nexium 24HR is your holiday helper for heartburn. It is the number one prescribed heartburn medication that is now available without a prescription. My favorite part is that you take the pill once a day instead of waiting for the pain to begin. I know when I'm going to be eating rich foods I'm going to get heartburn. 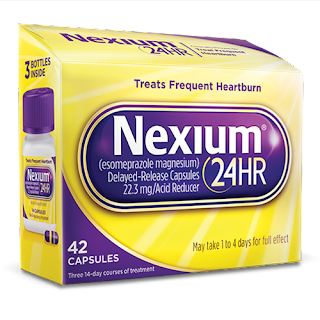 It's just a fact of life with me, with Nexium 24HR I can prevent the heartburn from beginning. Which in my opinion is the best type of medicine out there. Don't you just love something that can prevent your problem from starting? I'm so glad that Nexium 24HR is available OTC. As a busy mom I will wait to see the doctor for months for something like heartburn. I like that I can go to my local drugstore or grocery store and pick it up without making a doctor's appointment. Want to try Nexium 24HR for yourself? Nexium is offering a $6 off coupon on their website. And be sure to follow them on Facebook for updates and offers. And to make your holidays a little brighter, I have a $25 American Express gift card for one lucky reader. Enter to win on the Rafflecopter form. I didn't like stuffing until I had my MIL's cornbread stuffing and now I love it. It's one of my favorite's too.